Located off the northwest tip of Bird's Head Peninsula on the island of New Guinea, in the province of West Papua, Raja Ampat, or the Four Kings, is an archipelago comprising over 1,500 small islands, caves, and shoals surrounding the four main islands of Misool, Salawati, Batanta, Waigeo and the smaller island of Kofiau. 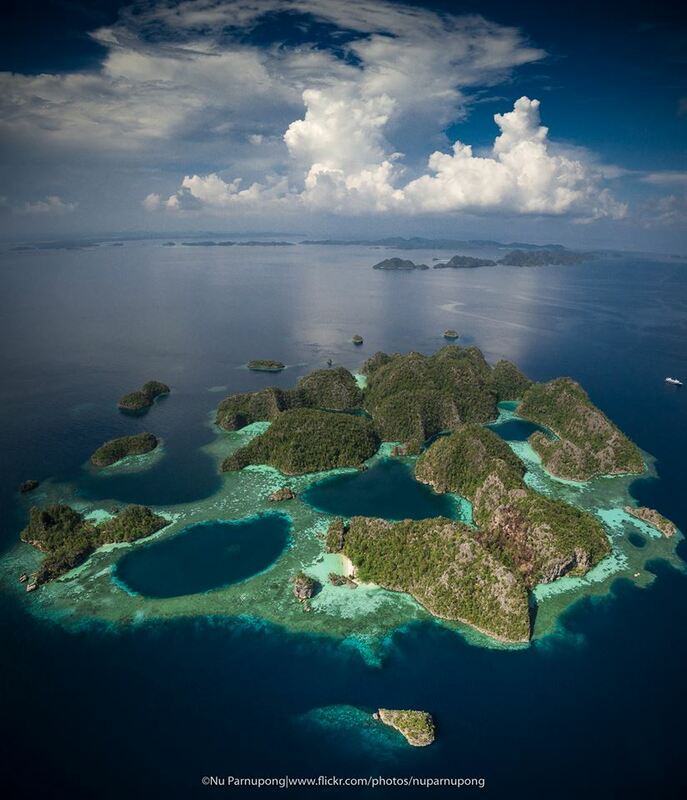 Raja Ampat is a new regency which separated from Sorong Regency in 2004. It encompasses more than 40,000 km² of land and sea, which also contains Cenderawasih Bay, the largest national marine park in Indonesia. It is a part of West Papua, which was formerly known as Irian Jaya. Some of the islands are the northernmost pieces of land in the Australian continent. Raja Ampat or ‘Four Kings’ is a true diver’s paradise, a wonderland lost in time, incredible natural beauty dominates above and below the blue waters; steep jungle covered limestone islands, stunning white sand beaches, hidden lagoons, and dense mangrove forests combine to create over 9.8 million acres of National Park. Underwater more than 1000 types of reef fish, 540 types of corals, sharks, rays, turtles, dolphins and even whales call the park their home. This is the holy grail of dive destinations, truly one of the most beautiful places in the world. 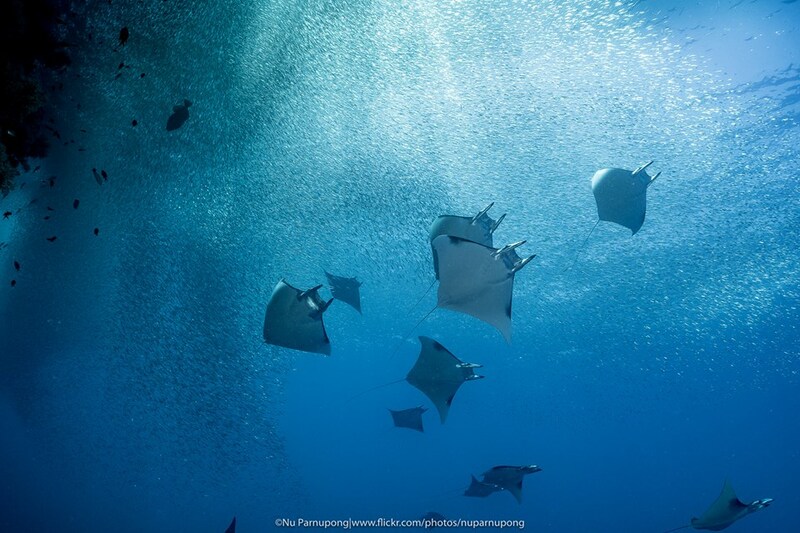 We invite you to discover a diver’s heaven on earth. Raja Ampat will immerse you in a diving paradise: rich & varied topography, with the world’s richest underwater bio-diversity and sheer abundance or marine life to keep you coming back for more. 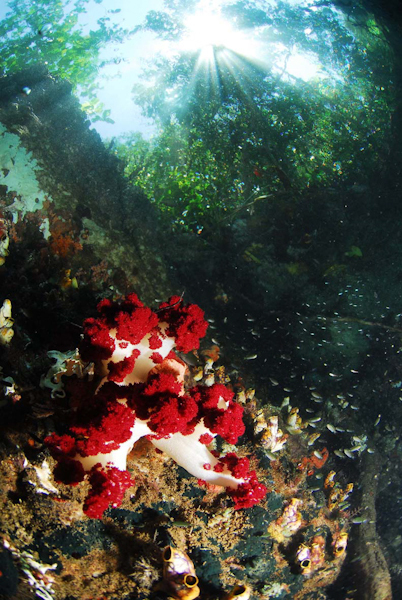 The huge variety of coral and fish life is reflected in the diversity of dive sites you will visit; Walls, slopes, caves, canyons, seamounts, muck diving and more can be found in Raja Ampat. 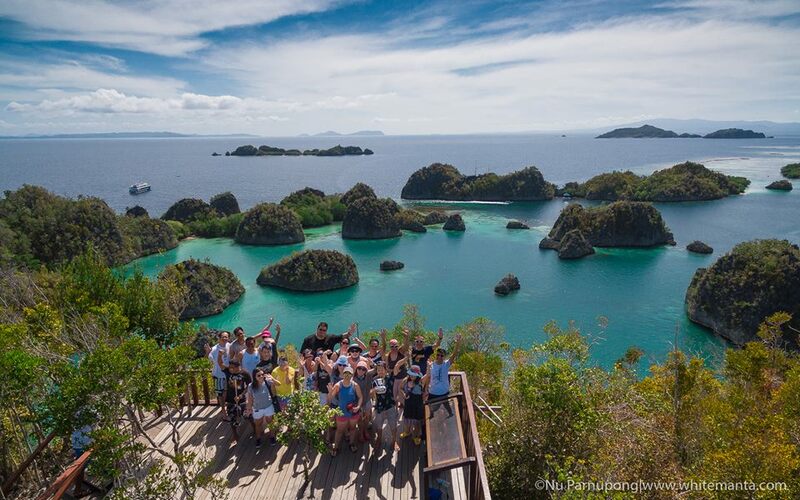 There are so many divesites to choose from in Raja Ampat that no two trips are ever the same, with such a large area to explore new sites are found all the time, adding to the already extensive list of world renowned sites. In the North / Central region of the park, distinctive dive sites include Cape Kri, for amazing pelagic action in swift currents, Mellissa’s Garden, for stunning hard coral gardens, Blue Magic; an underwater pinnacle that attracts hunting pelagics & doubles as a Manta cleaning station, & Mangrove Ridge; a stunning coral reef where shallow, clear waters of the mangrove forest lead to an explosion of soft corals. 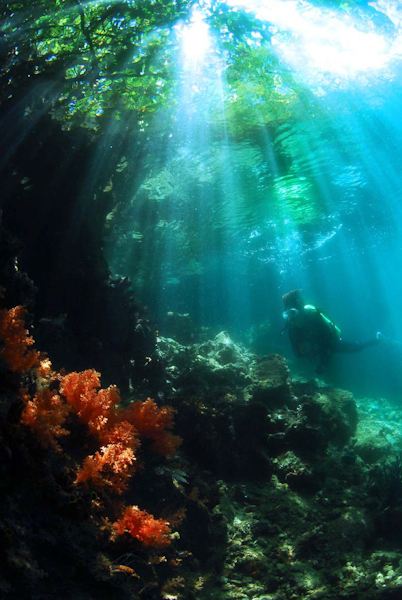 In the Southern region of the park around Misool a true diver’s paradise can be discovered. Explore the caves & swim thrus of Farondi Goa, come face to face with giant Manta’s at Magic Mountain and explore the current swept ridges of Boo Windows & Nudi Rock, where sharks, Napolean wrasse & jacks gather & smaller macro delights such as pygmy seahorses & nudi’s reward those with sharp eyes. 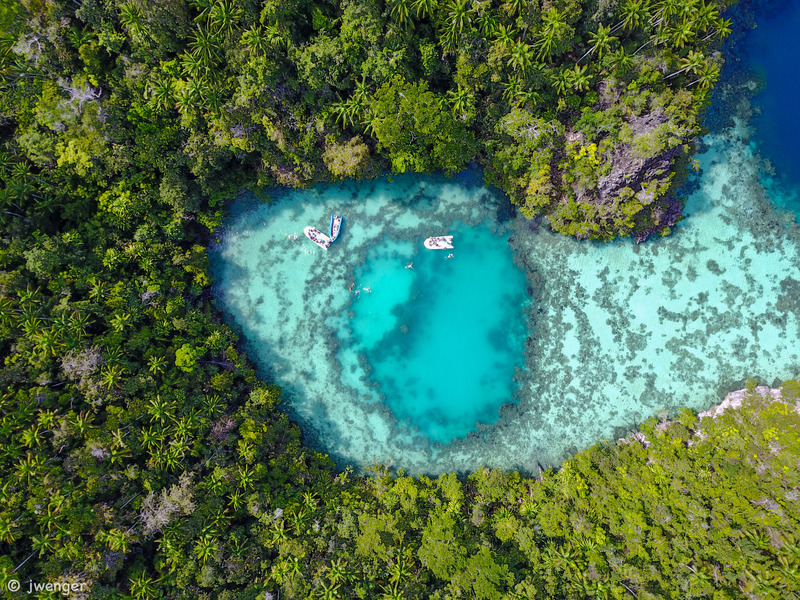 The stunning beauty of Raja Ampat's exotic & enchanting islands both above and below the water will leave you in no doubt that this is a true natural wonderland. See Raja Ampat divesites for more details of some of our favourite divesites in both the north & south of this magnificent national park. 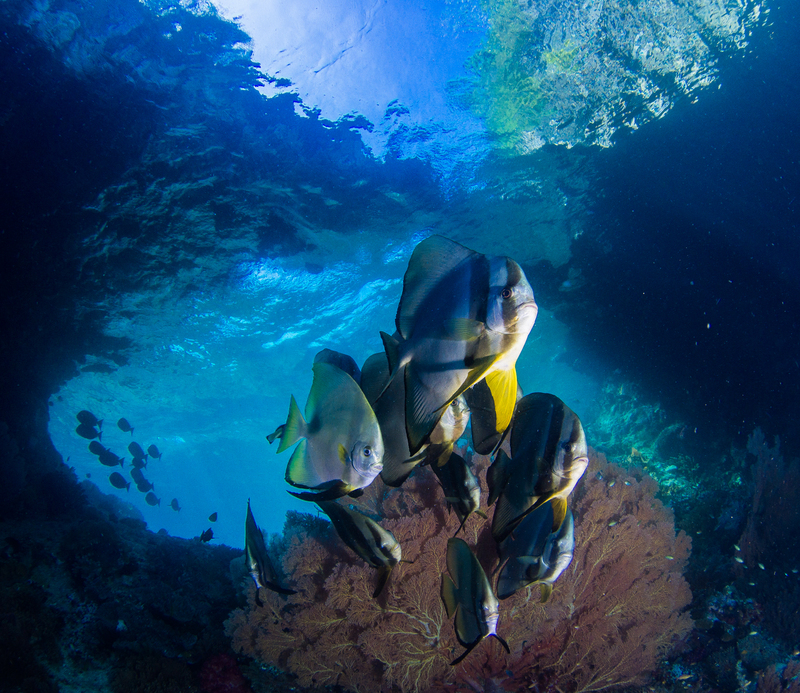 Raja Ampat is all about diversity - not only diversity of species, but also of dive sites. There are some areas where soft corals and sea fans dominate, others with hard corals, seagrass beds, mangroves, shallow reefs, drop offs, caves, black sand and white sand…and there are more species of fish life here anywhere else in the world. 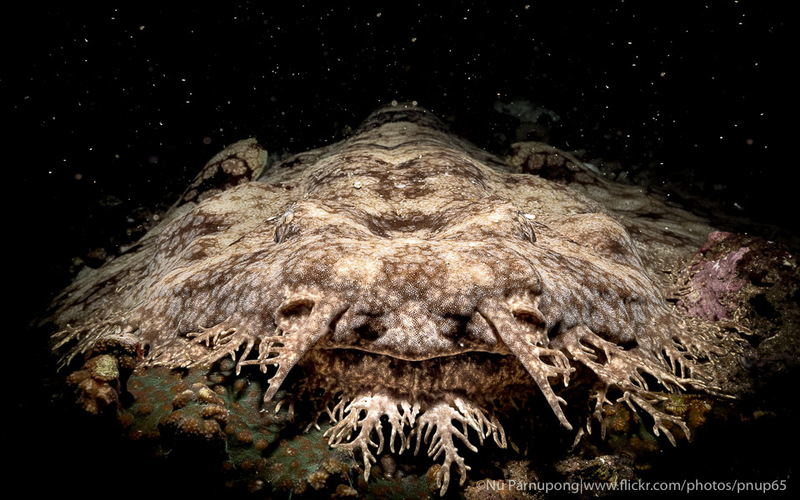 Here, all the levels of the food chain are well represented – from pygmy seahorses to top predators, from manta ray to nudibranch, Raja Ampat has it all! Raja Ampat trips start and finish in Sorong, West Papua, we will be there to meet you at Sorong Airport (SOQ) and transport you to your liveaboard adventure. It is easiest to fly to & from Sorong (SOQ) via Jakarta (CGK), Makassar (UPG Ujung Pandang), Bali (DPS, Denpasar), or Manado (MDC). International Flights; Silk Air operates regularly from Singapore to Manado. *Garuda Indonesia fly daily from Singapore to Makassar, then Domestic flight to Sorong. During the stopover in Makassar; you may wish to take advantage of some rest between flights, just remember to set your alarms in good time for your early flight to Sorong! Ibis Makassar Airport is located right on the side of the exit door, alternatively the Harper Perintis Hotel is just a 15min drive from the airport and offers good value & comfortable rooms. *UPDATE; From 10 March 2018 Garuda Indonesia will offer direct flights from Jakarta to Sorong with flights GA 682 (ETD Jakarta 00:20 / ETA 06:35 Sorong ) and GA 683 (ETD Sorong 07:25 / ETA 08:55 Jakarta) both flights fit perfectly with our schedule and make the domestic flight so much more pleasant! Jakarta (CGK); If you are travelling via Jakarta some International & Domestic flights do not always arrive/depart from same terminal building. If yours is one here is a useful Transfer link. Note; If taking Garuda International flight to Jakarta and connecting directly to Sorong we recommend to double check the luggage belt in Jakarta incase your luggage is offloaded in error. Schedules; Please check the current schedule with your chosen operator before booking flights as schedules are subject change. WMD or recommended agents cannot be held responsible for any flight delays, cancellation, or changes in schedules.